Sitting there in plane view, like it has nothing to hide. But who are you really, persimmon? Ah yes, the persimmon. One of those strange liminal fruits of the world that, like the lychee or jack fruit, is known by some, occasionally encountered, but largely a mystery, a stranger lurking on the edges on the far edge of the apples and bananas. 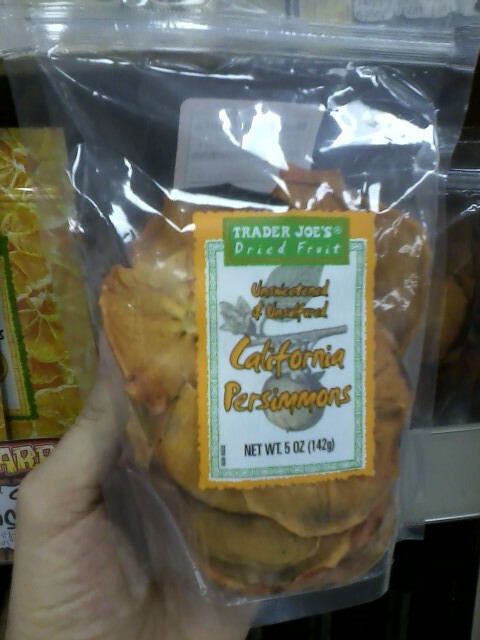 Where do you come from, Trader Joe’s Dried Persimmons? What do you want with us? You are liable to encounter a persimmon anywhere in the world, they are cultivated in narrow geographical regions from Asia, through the Middle East, into south America, and even – oddly enough – in Indiana. The most common type of persimmon, in it’s natural state, looks like a pallet-swapped tomato – orange and brown instead of red and green. They are sweet, with an almost pumpkin like taste an a texture somewhere between an apple and a firm tomato. All of this matter because Trader Joe’s Dried Persimmons are simply that – dried persimmons, proud members of the one ingredient club (Ingredient: persimmons). On top of this, the persimmons are both unsulfured (adding sulfur dioxide extends the shelf life of dried fruit, but causes allergic reactions in some individuals) and unsweetened. We’ve seen Trader Joe’s love of the unsulfured, dried fruit before , following their urge to provide dried fruit that are as healthy and as close to nature as possible. All of which means they;re good – chewy, pliable, quarter inch thick slices of a simple tasty fruit. It also means they’re hard to recommend to anyone who hasn’t ever tried persimmon before. If you have in fact bitten into the flesh of the tender persimmon, they you know if you’ll like these or not out the gate. It’s more of the same, the tastes intact, the meats merely drier. Autumn. The persimmon, hanging heavy and orange on a lone dark branch, is an autumn fruit. Dense with itself it hangs, plucking free into your hand with a pleasant heft. The skin is firm and taut, tight-packed with the fruit’s juicy flesh, juicy but not overflowing, not sopping, merely permeated with the sweet, wet juices. A sweetness that is all it’s own, a taste which is unlike any other fruit. Not the high, bright, intense sweetness of cherries or apples, but a low, earthy sweetness, a mild, slow sweetness like a toned-down brown sugar, not a clean, clear touch on the tongue, but a lingering, mealy embrace – a pliable laying upon the tongue like the flesh of the banana. Your teeth pierce the skin, and at the first, at the very front of the bite, it is not sweet at all, but rich like a squash, like a ripe, late season pumpkin, and only then, only after you know it as that, comes the the mild slow sweetness and the moist, chewy flesh. There you are. That’s the best I’ve got. If that sounds like the taste for you, by all means go ahead and pick up some persimmon, either dried or otherwise. If you’ve tired persimmon before and now regard me as an idiot, please post your more accurate description in the comments below. Would I recommend it: Yes, if you like persimmons. Would I Buy it Again: It’s nice, but my need for persimmons is not that high. 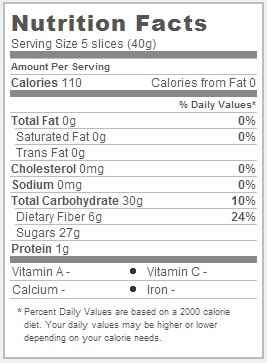 Final Synopsis: If you think regular persimmons are too moist for your purposes, this is the product for you. Have these already been discontinued? I haven’t been able to find them at the stores anymore the past week or so. Dried persimmons are one of my greatest discoveries at Trader Joe’s. My question is when are they in season, is there any predictability? I hadn’t seen them in a while, then last night a shelf was full so I’m going back for more asap to stock up. They are so delicious! I was told production takes place from Dec. to March only. What country are the dried persimmons sourced from? It’s Trader Joe’s own brand and it’s product of Calif.